Help your dog ward off bad breath, gum disease, infections, and heart disease. 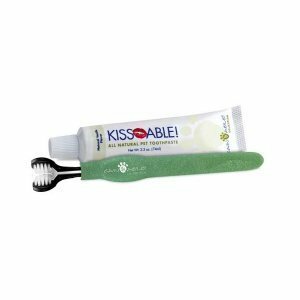 Brush your pet’s teeth with the Cain & Able KissAble Toothbrush and Toothpaste. The all-natural vanilla-flavored toothpaste contains tetrasodium, tetrapotassium phosphate, kaolin, tea tree oil, and stevia and vanilla, which are natural sweeteners that create a great taste without raising your pet’s glycemic index. The uniquely designed KissAble toothbrush cleans all 3 sides of the tooth with a single stroke. Soft bristles massage the gums, while firm bristles clean teeth to an antiseptic shine. The padded handle is easy to grip. No rinsing is required. 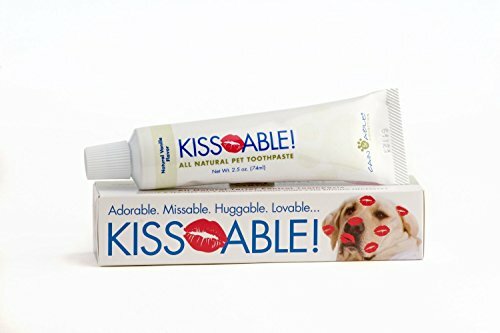 Made in the U.S.A.
Cain & Able Collection's KissAble Toothpaste is an all-natural, vanilla flavored toothpaste for dogs. It helps to ward off bad breath, and gum disease which can lead to other infections. The no-rinse formula contains tetrasodium and Tetrapotassium to help reduce tarter build up, and a touch of tea tree oil which has antiseptic and antifungal properties. It is naturally sweetened with Stevia and Vanilla which creates a good taste and leaves breath smelling fresh. 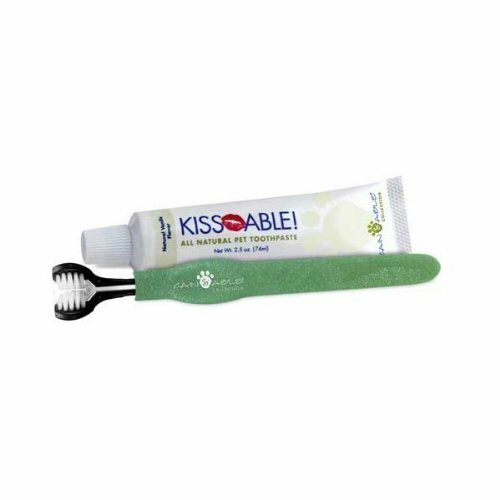 Cain & Able Collection's KissAble Toothpaste is available in a 2.5 oz tube and comes in its own box. 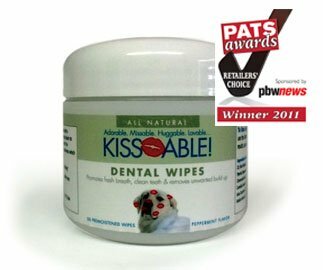 Help your dog ward off bad breath, gum disease, and heart disease by consistently brushing your dog's teeth using the Kissable dental combo kit. Each kit includes one toothbrush and one 2.5 ounce tube of all-natural vanilla flavor toothpaste. 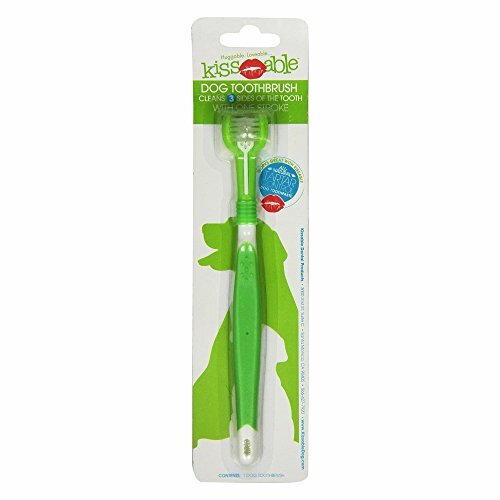 The sleek design of the Kissable toothbrush makes it easy to clean all sides of your dog's teeth. The soft bristles massage gums and help to remove tartar and plaque build up. The vanilla flavor toothpaste is all-natural and is great for dogs. Directions: Apply a dab of toothpaste on the toothbrush. Use short, horizontal strokes making sure to reach every tooth. No rinsing necessary. Ingredients: Water, Sorbitol, Hydrated Silica, Glycerin, Kaolin.Tetrapotassium Pyrophosphase, Tetrasodium Pyrophosphate, Vanilla, Xanthan Gum, Stevia, Tea Tree Oil. Dental Wipes 50pads. These gentle wipes are perfect for the dog who resists brushing with a toothbrush, they clean the front and the back of the teeth at the same time. All natural herbal-infused dental wipes are great for dogs that won't let you brush with a toothbrush. They promote excellent oral hygiene while refreshing your dog's breath. These textured wipes contain baking soda which provides gentle abrasion to help remove unwanted build up. 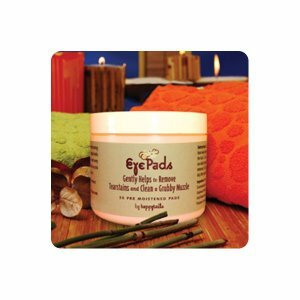 They also combine the gentleness of aloe with the antioxidant power of pomegranate. Aloe works like a toothpaste to eliminate disease causing bacteria in the mouth and the latest research on pomegranate shows that it is beneficial in reducing dental plaque accumulation and gum disease. 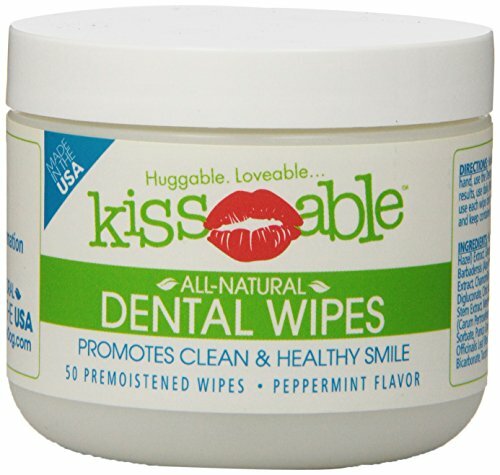 The Wipes Also contain grape seed extract, rosemary, lavender and parsley, which help to promote good oral hygiene. "According to the American Veterinary Dental Society, more than 80% of dogs suffer from periodontal diseases by the age of two. Help your dog ward off bad breath, gum disease, multiple infections, and heart disease by consistently brushing your dog's teeth, always furnishing fresh and clean water, while feeding your best friend a nutritious diet. 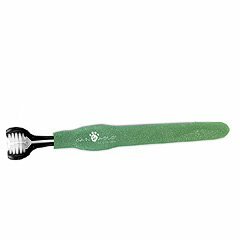 The Kissable Finger Brushes are great for small size dogs, or dogs who resist using a toothbrush. There are five finger brushes included in this set. Directions: Place a small amount of Kissable Tartar Control Toothpaste on the bristles of the finger toothbrush and gently brush your dog's teeth." According to the American Veterinary Dental Society, more than 80% of dogs suffer from periodontal disease by the age of two. Help your dog ward of bad breath, gum disease, multiple infections, and heart disease by consistently brushing your dog's teeth. The unique design of the KissAble toothbrush makes it easy to clean all three sides of the tooth with one stroke. The soft bristles massage the gums while the firmer bristles clean teeth. 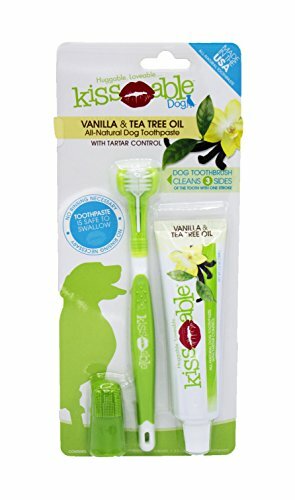 The vanilla flavored toothpaste is All Natural and is great for dogs and their people! According to the American Veterinary Dental Society, more than 80% of dogs suffer from periodontal disease by the age of two. Help your dog ward of bad breath, gum disease, multiple infections, and heart disease by consistently brushing your dog's teeth. The vanilla flavored toothpaste is All Natural and is great for dogs and their people! "According to the American Veterinary Dental Society, more than 80% of dogs suffer from periodontal diseases by the age of two. Help your dog ward off bad breath, gum disease, multiple infections, and heart disease by consistently brushing your dog's teeth, always furnishing fresh and clean water, while feeding your best friend a nutritious diet. All Natural Vanilla Flavored Dog Toothpaste is safe and effective way to help keep your dog's oral hygiene in check. Works great in conjunction with our Kissable Toothbrush. Directions: Apply a dab of toothpaste on the toothbrush. Use short, horizontal strokes making sure to reach every tooth. No rinsing necessary. Ingredients: Water, Sorbitol, Hydrated Silica, Glycerin, Kaolin, Tetrapotassium Pyrophosphase, Tetrasodium Pyrophosphate, Vanilla, Xanthan Gum, Stevia, Tea Tree Oil." All Natural, No Brushing Necessary, Helps Fight Plaque and Tartar Buildup, Made in the USA, Simply Add to your Dog's Water Bowl. "According to the American Veterinary Dental Society, more than 80% of dogs suffer from periodontal diseases by the age of two. Help your dog ward off bad breath, gum disease, multiple infections, and heart disease by consistently brushing your dog's teeth, always furnishing fresh and clean water, while feeding your best friend a nutritious diet. Three-sided toothbrush allows for you to brush all sides of your pet's teeth with one stroke. Works great with our Vanilla Flavored Kissable Toothpaste. Great for any size dog. Directions: Apply a dab of toothpaste on the toothbrush. Use short, horizontal strokes making sure to reach every tooth."